James Bond - The Secret Agent: James Bonds face is "No more"
I can't say that I remember, back in the 50's and 60's, when the British Pan Book series had glorious covers where you could see Bonds face. The reason I cant remember this is that like most of you, I was not born yet. I wrote a blog post a few months back saying that I believed that for some reason Ian Fleming Publications did not want to use James Bond's face on a cover. You can read that blog post here! In that very same blog post I contacted the illustrator for the new US TRIGGER MORTIS paperback edition Patrick Léger but he turned down my suggestion of an interview. 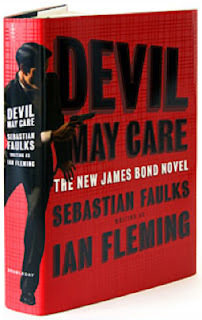 I was therefore very happy that Ian Fleming Publications made an interview with Patrick on their updated website under their banner "Agent in the field"
"Not being able to show James Bonds face was an interesting challenge"
So in other words the offer to do the cover was with limitations. The face was not to be seen. As a huge James Bond fan and book collector I think this is a bit sad. I think that the reason we were so many who liked the cover for the US paperback was because it was retro and had a drawing with James Bond in it. I can't actually remember when that happened for the last time in theUK! In the US it was with the release of DEVIL MAY CARE but there, once again, did the painting not show James Bond from the front but from the side with a shadow on his face. So in the future it looks like we should not hold our breath while waiting for 007 to show his face on a book cover again. No matter how much we would like it to be there. But we should be very happy that Patrick Léger atleast shared his version of Bonds face with us on the net.